From the early days as a designer at John Kaldor in the 80's, to working on her home furnishing label Art Park, to a more recent iteration, Prints Charming Original Fabrics, Cath Derksema has always been one to roll with change. In an tough industry with little support in the way of funding, local manufacturing and supply, it' encouraging to see Cath's passion for textiles ... for supporting other makers & for passing on her knowledge as she evolves with the times. Cath seems to have a knack of finding the positives and developing something unique. Something better. She just ... Makes It Happen! 1. What is The Happenstore? How is it different from other shops in Sydney? 2. How did it come about? It evolved as I needed a new studio! Throughout my life as an artisan I have been thwarted by property developers. Always working from inspiring and interesting warehouse spaces, always led me to being on the move, as they were inevitably developed (DON'T GET ME STARTED!). The moment I saw this shop I knew it held more mystery and potential, than a space just for me. 4. What gets you up in the morning Cath? Excitement and the unknown get me up every morning. I never know what is around the corner and I LOVE that! 3. Why is it called The Happenstore? The name evolved from one of my favorite words 'happenstance' ... it embraces the magic of things just 'happening'. 5. What has been the bravest thing you've had to do in the making/running of The Happenstore? The bravest thing I've had to do in the making of The Happenstore is committing to a lease and increasing my rent significantly ... The store needed a lot of hard yakka in bringing it up to a contemporary street level...it had been a guitar shop for 30yrs and needed a lot of TLC..Negotiating with real estate agents is not for the faint hearted! My advice for anyone wanting to open a retail space in Sydney ... have a strong budget and stick to it! It is expensive and there are often many hidden costs ... Be super creative in pushing through these and be prepared for initial compromise. Have endless energy and passion for your vision and GO FOR IT! Sydney NEEDS creative spaces that are public and inclusive. 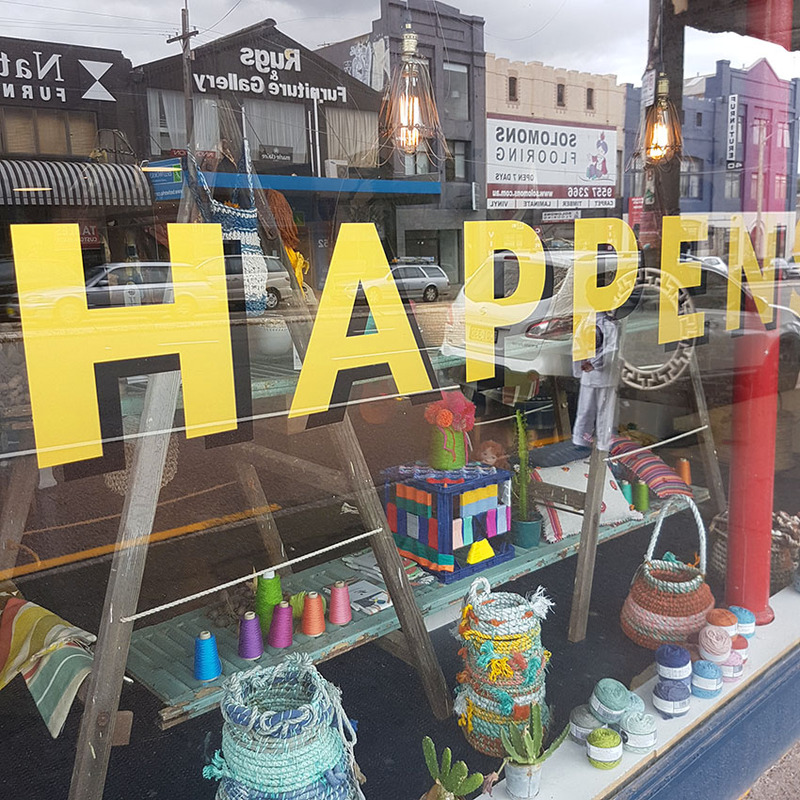 You can find Cath & The Happenstore at 55 Parramatta Rd, Annandale in Sydney's inner west. For more info & opening times, please click here.